The 2012 Bengal Bouts final matches will be held Saturday, March 3rd, at 7:00pm in the Joyce Center. Bengal Bouts is an annual intramural boxing tournament that raises money for the Holy Cross Missions in Bangladesh. While the first student tournament was in 1932, charity boxing matches for the Bengal Missions date back to the 1920s. In the 1920s and 1930s, sporting matches of all kinds were organized as a means to raise funds for deserving causes. 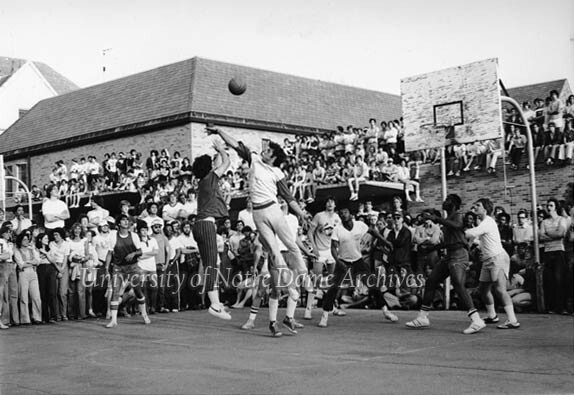 This was no less true at Notre Dame and a favorite charity among the students was the Holy Cross work in Bangladesh. In 1921, the students of Brownson Hall organized a smoker that featured “boxing, wrestling, a tribute to Coach Rockne, and a talk by Father O’Donnell,” and raised $150 for the Bengal Missions. In 1922 and 1923, Brother Alan arranged the Bengalese Boxing Bouts with exhibitions of outside boxers. 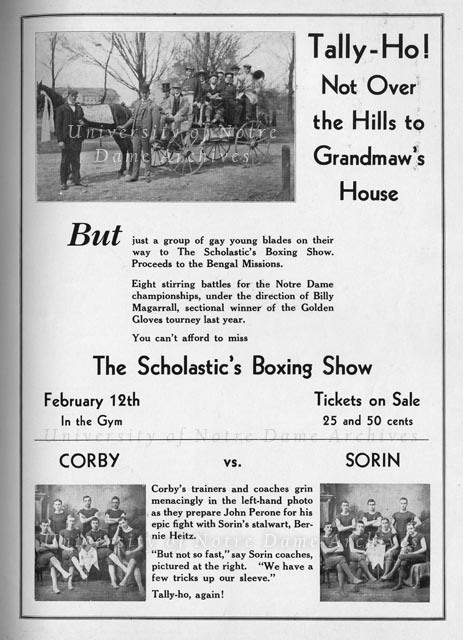 February 12, 1932, marked the first annual “Scholastic Boxing Show,” organized by the student magazine Scholastic with Notre Dame students making up the contenders. This first tournament was set up more like an interhall match, with representatives from each dorm making up the contestants. 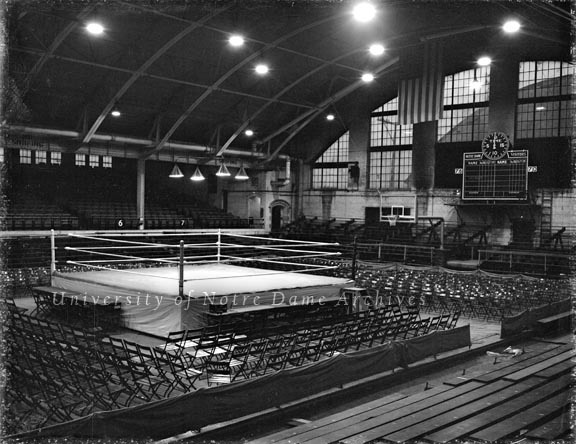 Nearly two thousand people from the University and surrounding communities made up the audience, which was a record attendance for a boxing match at Notre Dame. The continued success of Bengal Bouts would not have been possible without the oversight of Dominick “Nappy” Napolitano (1907-1986). Nappy trained and mentored nearly every student boxer for more than fifty years. He made sure the fights were clean and fair, which was often in contrast to the culture surrounding professional boxing. As Budd Schulberg witnessed in 1955, “You’ll see boys battling harder for the University championships than some heavyweights have fought for the championship of the world. You will see contestants beautifully conditioned and boxing under rules of safety precaution that have precluded any serious injury in the quarter-century history of the bouts. Here are boys who will fight their hearts out in the five-day tournament for pride and the pure sport of it” [Sports Illustrated]. In the end, the Bengal Missions are the perennial winners of the Bengal Bouts. 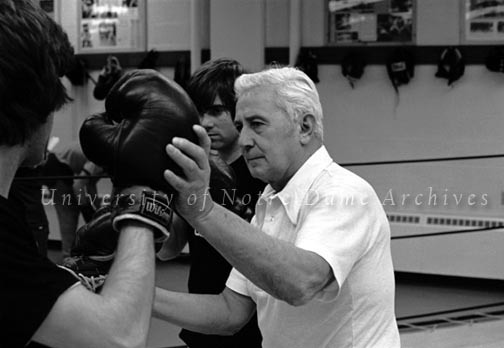 For over eighty years, these boxing matches have helped the Congregation of Holy Cross to provide service to the poor of Bangladesh by establishing and maintaining medical dispensaries and educational institutions. wow. A lot of schools cannot brag to have been involved this much into variety of sports even today.